Summary: Pointing and re-pointing patio slabs and pointing and repointing garden paths. A DIY guide to pointing paving slabs, patio slabs, and garden paths using a variety of different products available at B G Fencing Ltd.
Over time the joints between paving flags whether it be Natural Indian Sandstone or Concrete paving will start to crack and become loose. This is mainly due to the ground moving over time, freeze-thaw action over winter and paving flags being jetwashed. For new patios, or patios and paving where there is not a lot of the existing pointing left, its better to cut out all of the old stuff and start again. A hammer and chisel are the best tools for this. Do not attempt to use an angle grinder unless you are used to handling one as they can quite easily skid across the surface of your slabs, marking them badly. We sell pre mixed 25kg bags of Motar mix, all you need to do is add the water and start pointing the flags. All you will need is a; Bucket, Trowel, Pointing Trowel. 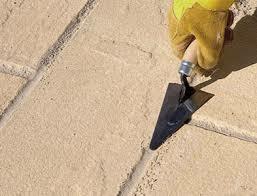 Simply mix the sand and cement with water and trowel in the gaps of your paving making sure that you fill all the voids. Once the motar has reached the top of the flag simply smooth off the top surface. 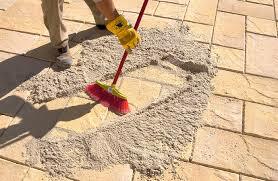 Make sure to clean off any excess motar off the paving when finished. 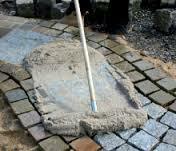 Ensure that the paving to be jointed is dry and free from loose dirt, debris, oil, grease, etc. It is essential that joint widths are a minimum of 5mm wide with a minimum depth of 25mm. Deeper joints can be part filled with dry sand or other dry materials, to the required minimum depth. Carefully open the vacuum packed bag and sprinkle Geo-Fix® Jointing Compound sufficient to cover an area of 4-5 m2 (see coverage table below) Using a soft brush, push the Geo-Fix® Jointing Compound into the joints ensuring that they are filled with the compound. To ensure a perfect joint press Geo-Fix® Jointing Compound into the joints with a pointing tool, or compact into joints using a vibrating plate. Top up as necessary. Any residue left on the surface when cured can be simply cleaned off by sweeping with a stiff brush. A specialist solution to filling joints between paving slabs and setts, suitable for natural stone and concrete paving on pedestrian and vehicular areas with medium to heavy vehicle loads up to 7.5 tonnes. The two part epoxy resin system is easily mixed and quickly applied as a slurry to dampened paving. It has increased water tolerance to give the great advantage enabling use in damp weather and light rain. All of these products are readily available here at BG Fencing where our staff will be more than happy to answer any questions you may have. We also have a Natural Stone paving display where we can show you first hand the colour of the different joint compounds.